Fighting games more than any other often get stick for not innovating, for not changing up the core gameplay they're built on. Tekken 7 manages to balance a decades-old fighting system with some fancy new mechanics that charge the game up with enough violent energy to make it a worthwhile release in a console generation that's already brimming with fighters. Tekken 7 does an exemplary job of bringing the 3D fighter kicking and screaming into 2017. Considering the game has been alive in Japanese arcades now for over two years now, the core balance of the title feels perfect on console release. Every kick, every punch, every headbutt and every grapple feels perfectly weighted and satisfying to pull off. For casual fans that remember Tekken 3 back on the original PlayStation and want some light beat-'em-up action, this game won't let you down. The massive character roster is accessible enough for casual players to understand but deep enough for more serious fighters to get their teeth into, too, and in balancing those two sides of the game, Tekken 7 has done what the likes of Street Fighter V failed to do: appeal to an audience that might not typically be interested in fighting games. Tekken 7 Review: The Best 3D Fighter Of 2017? This appeal is helped by the game's story mode: a single-player affair that most fighting games seem to be adopting these days (see: Mortal Kombat, Street Fighter V and Injustice), which takes you on a tour of the impressive roster of characters whilst playing cutscenes that serve to explain Tekken's absolutely insane storyline. Which is all about patricide, murder and international zaibatsu vying for control of global power. It's a well-presented action film that errs on the edge of the ludicrous but totally owns it, and the way fights seamlessly run out of cutscenes is inspired. Single-player fighting fans might find the content offering a little short, especially if you enjoyed what Injustice 2 had to offer. Standard character endings in Tekken (traditionally unlocked via finishing the Arcade ladder) are gone, mixed instead into the main story mode. There is an endless Treasure mode that apes previous Tekken games' infinite ladders, and this is good fun if you want to fight ghosts from the game's proper arcade iteration, but other than that and the story mode, there isn't an awful lot to do if you're a lone wolf. Fun ol' Tekken modes like Ball or Force or Bowl have gone; the focus is instead on the fighting and to be honest, that's not really a bad thing. On the PlayStation 4, there is a VR mode, too, but it's totally forgettable - you'll use it once and never boot it up again. Street Fighter's mascot villain Akuma makes an appearance in Tekken 7 as both a playable character and a huge part of the story. You'd think thanks to his penchant for projectiles and reliance on moves that can absorb the impact of other fighters' attacks, he'd be a bit overpowered but Akuma actually fits into the world of Tekken wonderfully. His presence in the story doesn't feel as crowbarred-in as you'd expect, either, and Bandai Namco, the game's publisher, does an impressive job of making him feel like a powerful, threatening force. Playing Akuma and spamming fireballs at your opponents makes you realise how well balanced the game is, overall. Once you get hit by Akuma's ranged attacks a few times, you'll learn how to get in close (sidestep, dash) and then you can start to mitigate damage and play your counter. The same is true of just about any other character - like Tekken games past, every seemingly overpowered combo or setup has a very distinct counter, and you need to mix up your tactics if you want to come out on top. There's a playstyle for everyone, too: from the rushdown flailing of Lili, to the grappling of King or Shaheen, to the cautious zoning of Dragunov - every type of player will find their niche. Tekken's trademark juggle mechanic makes its return, too. Where 2D fighters rely on frame-perfect inputs for certain attacks, Tekken relies instead on bounds and bounces and keeping the player aerial, disabled and unable to punish you for missed attacks. Bandai Namco makes this advanced technique accessible enough for new players by loading new characters like Katarina and Claudio up with really simple combos that give you a taste for the advanced facet of Tekken 7 and tempt you to really get your teeth stuck in. There's also a new revenge mechanic in play in Tekken 7: once you get reduced to the final third of your health, you can trigger either a Rage Drive or a Rage art. The former buffs all your existing moves and makes them do more damage, the latter is basically a Super Move (it can even be mapped to a single button on your pad to make it easy to pull off). This means you can never take your place in the fight for granted, and that there's always a risk of throwing a game away… even if you've been dominating the entire match. It gives every fight a unique ebb and flow and really keeps the adrenaline up for the duration of what can sometimes be quite cautious games of footsie. Tekken 7 recaptures all the fun of the PlayStation era of fighting games without getting bogged down in useless mechanics and slapping contrived, over-the-top meters and bars all over the place. 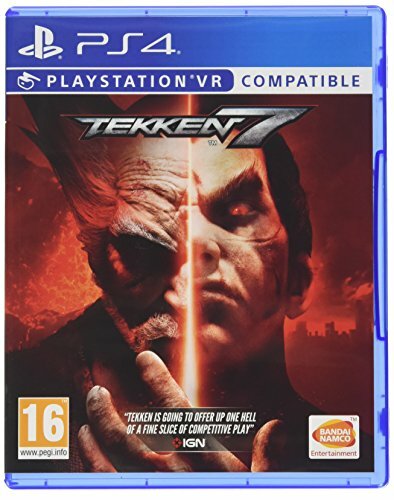 It's a high-damaging, high-impact fighting game that offers great replayability, an enjoyable learning curve a ludicrous story mode that catches up on the history of the Tekken universe and unveils new revelations, too.